Part of the landscaping works at Sanctuary Falls. Terraverde, an award-winning landscaping company, says it is close to completing the hardscaping and softscaping works at Sanctuary Falls, one of Dubai’s latest luxury residential communities. 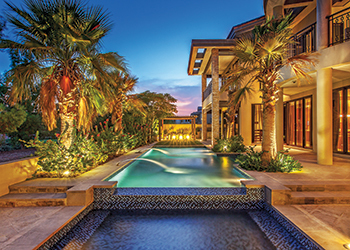 It will be bringing stunning garden concepts to life at the prestigious villa community. Sanctuary Falls, which is being developed by Shaikh Holdings in Dubai, features a collection of 97 luxury villas overlooking the Greg Norman-designed Earth Golf Course in Jumeirah Golf Estates. Imran Shaikh, CEO of Shaikh Holdings says: “The integral concept of Sanctuary Falls is resort-style living. Our architects, interior designers and landscape planners have worked with us to realise this concept, however to crystalise this thinking and to deliver on this vision requires contractors and suppliers that can execute. Designed by LMS International, each garden comprises a swimming pool, sunken shower, majlis seating area, sandstone tiling and an array of trees and plantation. The landscape concept itself, which has an opulent style in line with the grace of the villa, is designed and executed to give a sense of tranquility and serenity. In juxtaposition to the modern, contemporary interior, the outdoor living space of each villa is key in achieving luxury escapism for residents, assisting in providing the desired “resort lifestyle”. Conceived and created by world renowned hotel and resort architects, interior designers, landscape planners and landscape contractors such as TerraVerde, Sanctuary Falls offers a choice of five- and six-bedroom villas. The villas are constructed by Arabtec’s luxury villa division, and have won numerous awards for pioneering the ‘resort home’ concept that combines designer luxury with a resort lifestyle. It has been awarded the esteemed Bloomberg ‘Best International Golf Development’ award.